A guide to the principles and methods of data analysis that does not require knowledge of statistics or programming. A General Introduction to Data Analytics is an essential guide to understand and use data analytics. This book is written using easy-to-understand terms and does not require familiarity with statistics or programming. The authors-noted experts in the field-highlight an explanation of the intuition behind the basic data analytics techniques. The text also contains exercises and illustrative examples. Together with these learning resources, the book can be used in a 13-week course guide, one chapter per course topic. The book was written in a format that allows the understanding of the main data analytics concepts by non-mathematicians, non-statisticians and non-computer scientists interested in getting an introduction to data science. 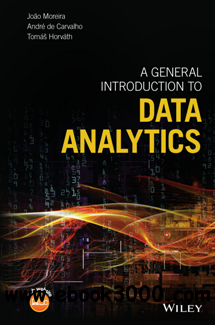 A General Introduction to Data Analytics is a basic guide to data analytics written in highly accessible terms.